Great service, staff are awesome Ronnie did wonderful. Got those pesky critters !! Thank you! Oleg is always available when we call! Cushman & Wakefield U.S. Inc.
Quick feedback and quality work. We are pleased with the quality of service and the professionalism of the company. Employees were good service was good thank you. Technician is always willing to complete all tasks that are requested and informs me of any issues. Both gentlemen that came were helpful, and informative. I appreciate their friendly demeanor and how hard they worked in the hot sun. Working with your employees is a pleasure. They take such great pride in their work and always get us taken care of quickly!! Napoleon, our Smithereen tech, is always accommodating to our schedule. He is thorough and performs his job with a smile. I have been happy with how responsive the service has been when called upon. Thank you. Brian is the best of the best! I've always been pleased with the service and when I needed them they came back until my issue was resolved. Our tech is always courteous and helpful. We were very unhappy with our previous Pest Management Service. Since we switched to Smithereen we have hardly seen a thing, which is great for business. Our technician is great and very helpful. We are very happy with the switch. Jason is always on time and does a thorough job. Our service guy, Jason, is very helpful, knowledgable and pleasant to work with. Our guy does a great job, always informative and friendly!!! Brian does a great job keeping our pests under control, thanks. Smithereen is attentive to our services and offer a diversified wealth of experience and service. Nice, professional and answers our questions. Great service and very knowledgeable Technicians. I have been impressed with their thorough approach and most important their results. Very friendly employees. Timely, efficient, and trustworthy. I have tried several Pest Management Services. This is the only one that took care of my problems. They are quite amazing. 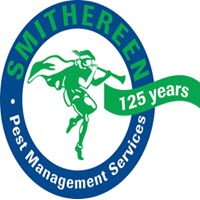 We have been using Smithereen Pest Management for years. We live on several acres. Before Smithereen the mice were so bad. There are 6 mice bate traps around the out side. No more mice. They come every 3 months to spray. No bugs. We also have them spray our barn/shop. No bugs. Their service tech are always very friendly. I highly recommend this company. I haven't had any kind of bugs or rodents since I started with them. Tom was at my house last week and done an excellent job. Smithereen is fantastic. Tim Munyan is a great employee who helped me understand the process very well. He made me feel taken care of and confident moving forward. Jason did the installation perfectly and thoroughly. Both very friendly guys. I would recommend them to anyone. I have been a customer for about 3 years as we battle recurring moles. My service technician, Ronny, does a great job of promptly appearing when we first notice the activity and gets it stopped immediately. I highly recommend them. Smithereen is GREAT!!!! They are professional and make sure to take care of all of our pest matters! I rate them 5 out of 5 stars!!!! Sandy from Overland Park KS. Our usual technician, Brian is always pleasant and takes his time in each unit and offers suggestions on those where problems are. The other technician who come are also very pleasant and helpful. We have used Smithereen for 5 years, the technicians do a great job, very happy with the company!